These are the arms of Archbishop Robert John Renison, granted in 1935 by Ulster King of Arms, differenced by the addition of a green border charged with maple leaves and buckles. The buckles are from the arms of Canon Archibald Howard Skirving, the Chairman of the Board of Governors at the time of the grant. 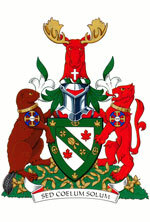 The moose’s head comes from the arms of Archbishop Renison. The cross on the neck is an allusion to the arms of Ian L. Campbell, the Principal at the time of the grant. 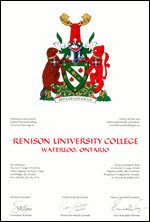 The red lion is taken from the arms of the University of Waterloo, and thus symbolizes Renison’s affiliation with the university. The red lion is also found in the arms of Bishop D. Ralph Spence, Chancellor of the College at the time of the grant. The beaver is taken from the arms of the Anglican Diocese of Huron, the Bishop of which is the Visitor to the College. The wagon wheel is taken from the arms of the Church of the Holy Saviour, Waterloo, the founding parish of the college. The grassy green mount represents Renison’s verdant campus. The trilliums recall the college’s location in Ontario and the Regional Municipality of Waterloo, because they are the provincial flower and are found in the Region’s arms. The maple keys symbolize the founders of the college and their vision that those being educated will grow and develop for the benefit of their communities. Meaning “But under one sky”, this Latin phrase was the motto of Archbishop Renison, who favoured it in the form “One sky over all”. The announcement of the Letters Patent was made on March 14, 2015, in Volume 149, page 501 of the Canada Gazette. Original concept of Howard Rokeby-Thomas and David Bowyer (Arms); Malcolm Innes, Lord Lyon King of Arms (Crest); and D. Ralph Spence, Albion Herald Extraordinary, and Brendon Bedford (supporters), assisted by the heralds of the Canadian Heraldic Authority. 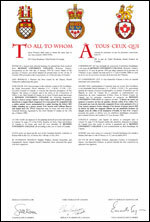 The recipient's emblems were originally recorded in the Public Register of Arms, Flag and Badges of Canada, Vol. VI, page 30.